The Laramie Foothills is the northern part of the Front Range of the Colorado Rocky Mountains. The photo above was taken from the top of Greyrock Mountain looking towards the north. This photo displays a variety of geological formations. Greyrock mountain is part of the 1.3 Ga old Log Cabin Batholith. Composed of grey to pink, medium to coarse grained granite composed of quartz, microline, plagioclase and biotite, lacks hornblende. The two peaks in the top/center of the photo is the Sugar Loafs which is southern border of the Sherman Batholith. The land north of the Sugar Loafs are sedimentary rock formations that formed near the sea level some 300 million years ago. About 70 million years ago the Rocky Mountains intruded the sedimentary formations, during a geological event named the "Laramide Orogeny". The current accepted hypothesis proposes that this event was the result of two of the earths plates, the Kula and the Farallon sliding under the North American plate. As the Rockies formed, the basin and mountain blocks were created. The basins contain some of the original sedimentary geological formations. The numerous batholiths that comprise the Rockies are some of the remaining rocks from a older mountain range the Ancestral Rocky Mountain Range, which was formed by the convergence of two ancient massive plates, the Gondwana and the Euramerica. The Ancestral Rocky Mountains were intracratonic block uplifts that formed in Colorado and the surrounding region during Pennsylvanian time. Their development related to the collision of North America with South America–Africa, which produced the Ouachita-Marathon orogeny. In Early Pennsylvanian time, suturing was taking place only in the Ouachita region, and foreland deformation took place only in the mid-continent. By Middle Pennsylvanian time, the length of the suture zone had increased, and it was active from the Ouachita to the Marathon region. The extent of cratonic deformation also increased in intensity and in areal extent, culminating in the Ancestral Rocky Mountains. 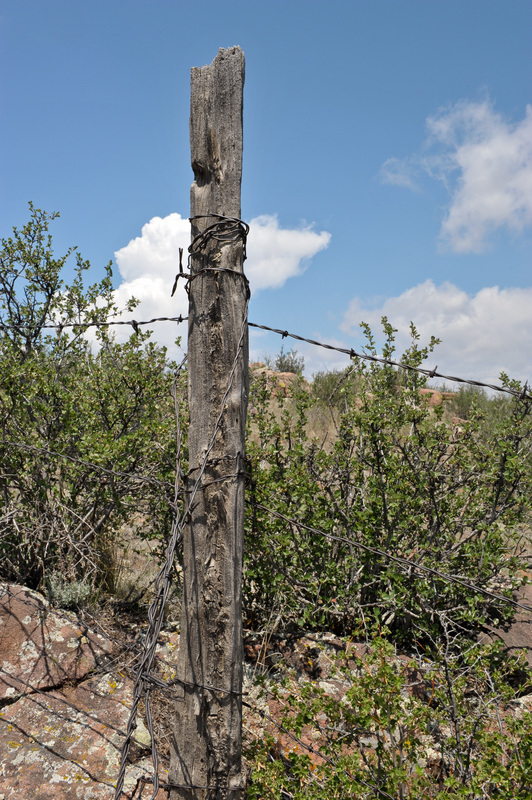 In Late Pennsylvanian time, suturing was taking place only in the Marathon region, and cratonic deformation decreased in extent and spread southward into New Mexico and West Texas. I suggest that the Ancestral Rocky Mountains, and related features over a broad area of the western United States, were formed while an irregularly bounded peninsula of the craton (including the transcontinental arch) was pushed northwestward by the progressive collision-suturing of North America and South America–Africa. This intraplate deformation is, in some respects, like the deformation of Asia in response to the Cenozoic collision with India. The smoothness, rounded shape of the rocks, the 'U' shaped drainages indicates that this area was covered with ice during the last Ice Age some 2.5 million of years ago. The pond on top of Greyrock is a glacial formation known as a cirque, which is formed when the glacier erodes the weatherized rock, leaving the harder rock that the glacier did not erode. A cubic foot of pure ice weighs 59.52 pounds. It is presumed that the depth of the glacier at the top of this mountain was at least 3,000 feet. Each square foot had 178,560 pounds bearing down on it. A square mile would have weighed ~1,240,588 tons. This enormous weigh caused the surface of the earth under the glacier to sink. As the glacier melted the ground rebounded. Years ago we lived at Yager's Homestead on the Poudre River which is south of this peak. Often I would walk to this spot during bright moon lite nights and swim in the pond. The tallest peak on the skyline on the left is Sherman Mountain Wyoming. Batholith - is a large emplacement of igneous intrusive rock that forms from cooled magma deep in the Earth's crust. Metaluminous - rocks that contain calcic phases such as hornblende and augite but lack muscovite. Orogeny - refers to forces and events leading to a large structural deformation of the Earth's crust and the upper most mantle due to engagements of tectonic plates. Pennsylvanian a geological era lasting from roughly 323 million of years ago to 298.9 million years ago. 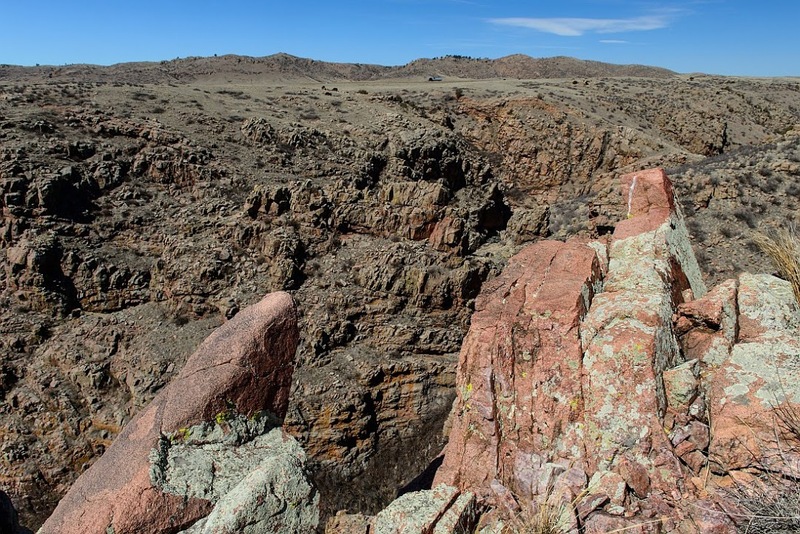 The 1.43 Ga old Sherman batholith of southeastern Wyoming and northeastern Colorado is a intrusion that is composed of rocks from at least four different sources. 1: The most significant is Sherman Granite, a coarse grained, metaluminous, biotite-hornblende. 2:Lincoln Granite, a medium-grained biotite granite. 3: Biotite granite rock that has a distinct difference in size of the crystals, that probably formed by interaction of granite and iron and magnesium rich magmas (mafic). 4: Mafic dikes and pods. The rock in the foreground is Sherman Granite. Between the two pinkish formations of the foreground across Stonewall creek is an example of Lincoln granite. This granite underlays the darker #3 type of rock. 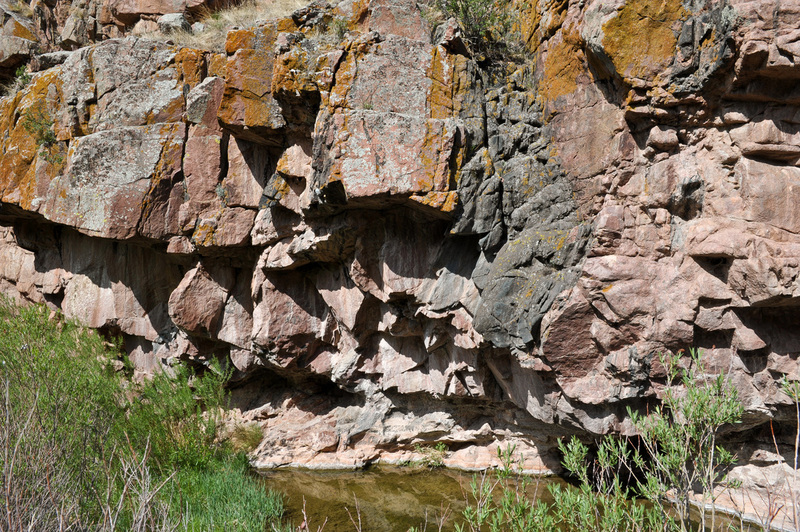 Individual outcropping of type 4 rocks can be found throughout the photo. Black mafic pod surrounded by Sherman Granite.